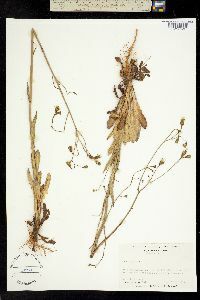 Annuals, 5-100 cm (taproots slender). Stems 1, erect, simple, proximally hispid and stipitate-glandular (viscid), distally gla­brous. Leaves basal and cauline; petiolate; blades oblanceolate or runcinate, 1-24 × 1-5 cm, (bases attenuate) margins deeply pinnately lobed to denticulate (lobes triangular, terminal lobes largest), apices obtuse to acute, faces densely stipitate-glandular (viscid). Heads 10-40, in loose, corymbiform arrays. Calyculi of 5-7, ovate or lanceolate, glabrous bractlets 1-2 mm. Involucres cylindric (turbinate in fruit), 8-12 × 3-5 mm. Phyllaries 10-14, (green medially) lanceolate, 8-10 mm, (bases strongly keeled and thickened, margins scarious), apices acute, faces glabrous. Florets 15-30; corollas light yellow, 5-12 mm. Cypselae (monomorphic or dimorphic) green to yellowish brown, subcylindric, outer 5-6 mm, inner 4-5 mm, apices attenuate (not beaked), ribs 10-12; pappi dusky white (very fine, fluffy), 4-5 mm. 2n = 8. Flowering Apr-Aug. Dry open habitats, rolling grasslands, pastures, abandoned fields, waste areas, railroads, roadsides; 0-3000 m; introduced; Ont. ; Ala., Ark., D.C., Ga., Ill., Ind., Ky., La., Md., Miss., Mo., N.C., Ohio, Okla., Oreg., S.C., Tenn., Tex., Va., W.Va.; Eurasia. 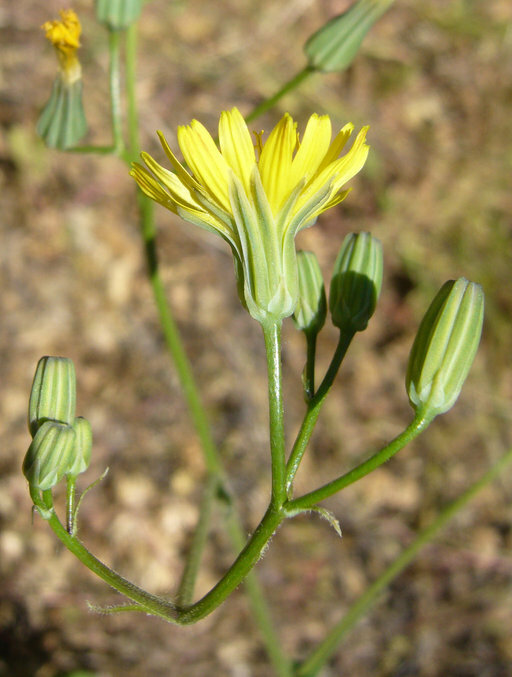 Crepis pulchra is identified by its annual habit; solitary, erect, glandular, and viscid stems; narrowly oblanceolate, runcinate, hispid leaves with relatively large terminal segments; glabrous and strongly keeled phyllaries; sometimes dimorphic cypselae; and fluffy, dusky white pappi. This species was found in Jefferson County in 1934 by Miss Edna Banta. 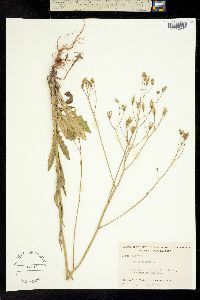 She reports that it is a common roadside weed from Eagle Hollow east of Madison eastward along the River Road to Morris Chapel, a mile east of Brooksburg, a distance of about 8 miles. The size and vigor of the plants sent me, being much branched and over three feet high, suggest that it is well established and will be able to compete with any native vegetation and forever be a weed in our state. I collected it in the same area in 1937. Taprooted annual 2-10 dm, the stem bearing spreading glandular hairs below, glabrous above; lvs spreading-hairy like the lower part of the stem, the lowermost ones to 20 נ4 cm, mostly oblanceolate or spatulate, short-petiolate, and coarsely toothed or runcinate-pinnatifid; heads mostly numerous; invol 8-12 mm, glabrous; inner bracts ca 13, generally with raised and thickened, basally expanded midrib; outer bracts very short; receptacle glabrous; fls ca 15-30; achenes 4-6 mm, contracted above but not beaked, stramineous or pale greenish, 10-12-ribbed, the outer ones scabrous-hirtellous; 2n=8. Native of Eurasia, locally established in waste places from Va. to O. and Ind. and southward. May, June.